Hi, I’m Pat Halpin, and I am an ecologist, and I study whales, and we have been tagging whales in Antarctica, to look at their behavior and their feeding patterns under the ice. The whale populations are coming back, but they were severely depleted, and so there’s a lot of work to be done to make sure we can stabilize those populations. One of the bog concerns in the future is as we have climate change, the ice edge is going to be retreating and we really don’t understand how that’s affecting the marine populations. Our main goal is to have baseline data, and to be able to understand how do these animals, these great whales, actually use the resources here. In Antarctica, we were primarily tagging humpback whales. So what we are interested in is to actually see how the whales use krill of other prey underwater, how deep they are diving, what kind of behavior they have. When we go out to tag, we actually put out two small boats. One of who will have a carbon fiber pole that they’ll use to attach the tag with suction cups. So literally chase the whale down and then, smack the tag on the back of the whale. And it’ll stick on, just usually for a day, or less. It doesn’t hurt the whale at all, it’s just suction cups. What we found is the whales were feeding like crazy all night and then sleeping during the day. We’d get up in the morning, and some of the tagging was fairly easy because the whales would be on the surface. And a lot of people don’t realize that whales will sleep, and they sleep on the surface, so many whales were fairly passive. So it was relatively easy, most of the time, sometimes not. 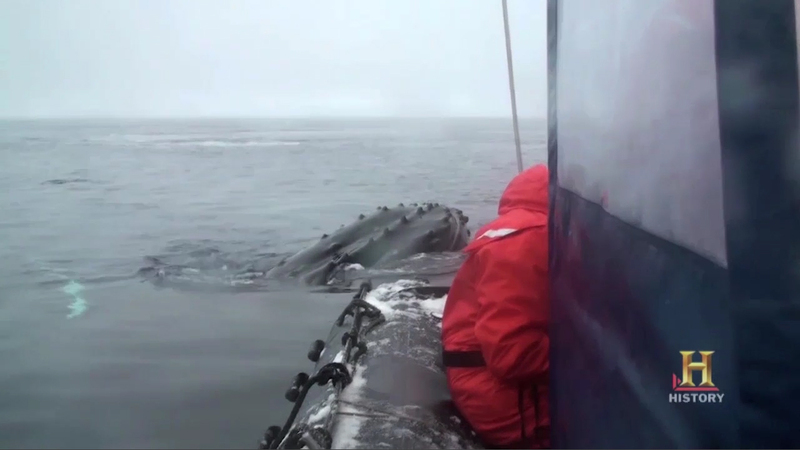 When you’re a small boat, in ice-filled seas, chasing whales, it’s kind of a unique experience. By tagging the whales, we get a position from GPS and we can track them and create computer simulations of the behavior of the exact movement of the whales. What we’re looking at here is the movement of a whale underwater, derived from the tag data, but then displayed using a software called TrackPlot. This software allows us to be able to take the raw data and be able to recreate it into an animation that shows their exact movement underwater. Using this, we can see how the whales respond to different levels of food in the water, how they’re diving on it, where they’re going, how they’re feeding, what kind of interaction they’re having with other whales. So this lets us tell the whole story, not just looking at where the whale went, but why the whale went into different locations. One of the things we’re finding is populations of whales that were hidden in bays late in the season, so people just really didn’t know were there. And so, we’re actually making some new discoveries to science, in places that just haven’t been observed. Without knowing the baseline, we don’t know how to manage these animals and how to manage the ecosystem properly. And without a baseline, we don’t know how to measure things into the future. And really this is some of the first work to try to document where we are today.